Andrew Kennedy's Angling Blog at Just-Fish.co.uk - Fishing Blog Coarse Fly Lure Pike Perch: Not something you'll see often! Not something you'll see often! This posting is about something that you won't catch me doing very often, but last weekend I fished a MATCH at Glebe Fishery (part of Ray Marlow's Mallory Fisheries) and managed to come second out of 11 entrants. It wasn't what I'd class as "proper" fishing - just lobbing a bait at a bunch of far-too-enthusiastic water pigs and reeling them in - but it was quite enjoyable to get a decent bend in the rod a few times. I mainly caught bream and carp, although there were a few roach and the odd perch amongst them, but others also caught crucians, rudd and barbel. 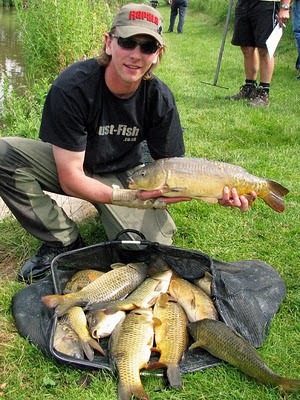 I ended up with 72lb 6oz, with my largest fish being a 9lb 6oz mirror carp. The Environment Agency has released an extremely handy feature on its website, for checking river levels. I believe it's based on the same data they use for their "rivercall" telephone service, but it's more up-to-date and it's free to access! The interactive map isn't the greatest unless you have the length and course of your favourite river permanently etched into your brain, it can be difficult to pick the right one out but with practice it's a decent system. Speaking of rivers, they're back on the agenda for my next blog! Near-3lb River Perch on the Fly!